A bit chilly and windy, so took a while to get going. But felt good last 2k. 7:30 - club track workout. 5:03, 4:55, 3:51, 3:50, 3:18, 3:19 (2:30 jog after 12s, 2:00 jog & 1:00 walk after 1000s). 2:30 - 12k easy in 1:06:37 @5:34/k. Gym workout. Resting for Sunday. 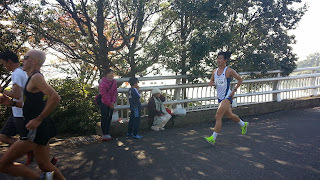 Toda Half Marathon (in Saitama pref., just north of Tokyo). Beautiful day for running, chilly in the morning, then warmed up. Temp was 17-18C/64F at the finish (12:00), which is my preferred temperature - I don't like cold weather. 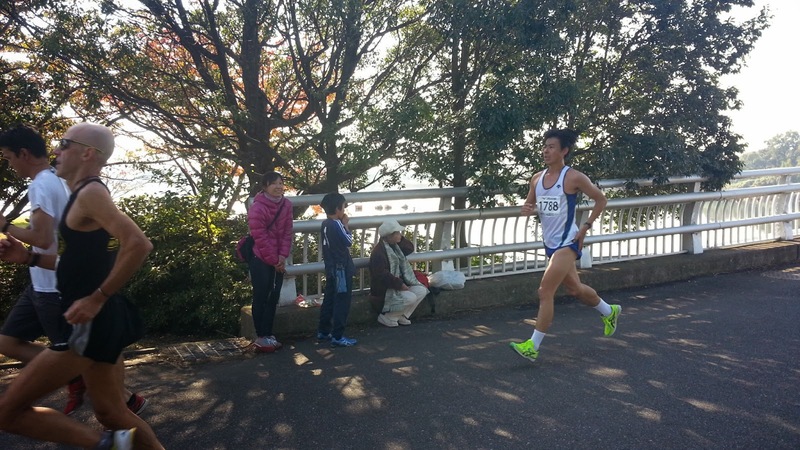 This is my favorite race in Japan. It's big, but not huge, there is good competition in each age group, it's a basically flat course on a wide, smooth asphalt surface, it starts at 11AM (the later, the better for me), it's in a nice green area and goes around a lake, and is very well organized. Also, there are two places with 180° turns after long straights, which I like because you can see who is ahead and behind you, and by how much (if you are trying to finish high in your age group) and also wave hello to your friends who are running. I ran a Half on Sept. 29 in 1:31:30 @4:20/k (26°), so wanted to run 4:10 pace today - 1:27:54. Went out a bit slower than that - just seemed comfortable at 4:14 or a bit more, but that was ok, as I was planning to pick it up at 15k. Had a few people to run with or behind most of the way and basically just felt real good the first 15k. Planned to pick it up at 15k and I did - just put the hammer down. I felt good and fortunately got into a good rhythm with another guy and we ran side by side for 4k. Managed to pick up the last k a bit more and had a good kick - in fact, I outkicked the first woman on the track at the end - sorry! I had noticed an "old guy" running a little ways ahead of me at about 8k, so I put in a little spurt at 10k (the 4:03) and passed him. He apparently also figured I was in his age group, so he pulled back ahead. This happened twice more, after which I was content to just cruise behind him, feeling pretty sure that I would leave him at 15k - and I did. Beat him by 1:15 (he was 5th). At the awards ceremony he said he was rather shocked when I ran away from him. So, 1:28:27, which is not great, but not bad. And I felt good the whole way, which was the best part. No hint of pain in my knee or anywhere else. 60s winner was 1:26:05. Actually, when I was 60 I won the age group in 1:23:30. 3rd was only 20 seconds ahead of me - next year! There were 264 in my age group. I got a Mizuno shoe bag for finishing 4th. That's a great final 6K Bob. You should be wrapped with that - well done. Hand on heart - you look a good 15 years younger than any of those 'old guys' up there on the podium. Well done on the good half. I thought your tempo run on Tuesday was pretty good as well. Very nice race Bob in a very competitive HM. Always a good sign when your last 5k split is the fastest. You're running well. it. Is there anybody getting identical RSS issues? Anybody who knows the answer can you kindly respond? reality. Do not let your guests to change the beans. Christian louboutin shoes Canada Goose Outlet Michael Kors Outlet Michael Kors Outlet Stores discovery what it appears to be palmy, wager strong. rightful select these tips. You can bring down your creative thinking weather.